In July 1998, a summer school in cryptology and data security was organized atthecomputersciencedepartmentofAarhusUniversity,Denmark.Thistook place as a part of a series of summer schools organized by the European Edu- tional Forum, an organizationconsisting of the researchcenters TUCS (Finland), IPA(Holland)andBRICS(Denmark,Aarhus).Thelocalorganizingcommittee consisted of Jan Camenisch, Janne Christensen, Ivan Damga? ard (chair), Karen Møller,andLouisSalvail.ThesummerschoolwassupportedbytheEuropean Union. Modern cryptology is an extremely fast growing ?eld and is of fundamental importance in very diverse areas, from theoretical complexity theory to practical electroniccommerceontheInternet.Wethereforesetouttoorganizeaschool that would enable young researchers and students to obtain an overview of some mainareas,coveringboththeoreticalandpracticaltopics.Itisfairtosaythat the school was a success, both in terms of attendance (136 participants from over20countries)andintermsofcontents.Itisapleasuretothankallofthe speakers for their cooperation and the high quality of their presentations. A total of 13 speakers gave talks: Mihir Bellare, University of California, San Diego; Gilles Brassard, University of Montreal; David Chaum, DigiCash; Ronald Cramer, ETH Zur ¨ ich; Ivan Damg? ard, BRICS; Burt Kaliski, RSA Inc.; Lars Knudsen, Bergen University; Peter Landrock, Cryptomathic; Kevin Mc- Curley, IBM Research, Almaden; Torben Pedersen, Cryptomathic; Bart Preneel, Leuven University; Louis Salvail, BRICS; Stefan Wolf, ETH Zur ¨ ich. 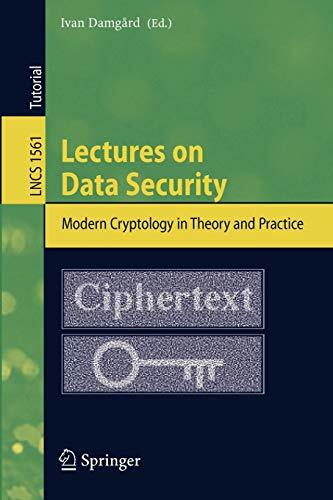 This tutorial volume is based on a summer school on cryptology and data security held in Aarhus, Denmark, in July 1998. The ten revised lectures presented are devoted to core topics in modern cryptololgy. In accordance with the educational objectives of the school, elementary introductions are provided to central topics, various examples are given of the problems encountered, and this is supplemented with solutions, open problems, and reference to further reading. The resulting book is ideally suited as an up-to-date introductory text for students and IT professionals interested in modern cryptology.